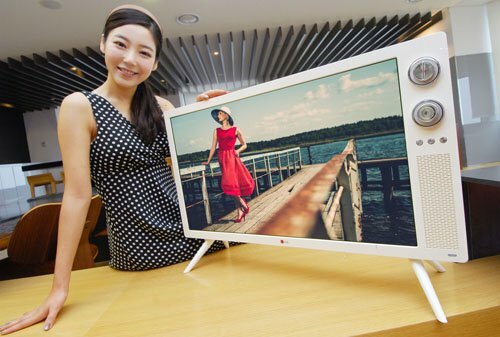 In a somewhat bizarre move, LG are launching a TV which is set to rekindle memories of the 1970’s. Many of BurnTech.TV’s readers probably don’t remember the days when changing channel was an ordeal. Back then, you actually had to get up to switch the channel. That said, there really weren’t very many channels to choose from. Colour TV has only properly arrived in the 1960’s, and it took until 1969 for the BBC to properly launch their colour channel, which became BBC 2. By 1970 the British viewer was blessed with three colour channels – BBC 1, BBC 2 and ITV. The TV’s themselves were blocky and ugly, consisting of a cathode ray tube (CRT) system that delivered far from high-definition pictures. We now live in an age where we have access to hundreds of channels on Sky, Virgin or BT. A simple flick of the remote lets us browse through these ample channels without moving. We can view the pictures in stunning HD, or even in 3D. If we choose, we can even access a thing called the internet through our smart TV. So on the surface of things, there’s not a huge amount for LG to get nostalgic about when it comes to the 1970’s and television. However, the South Korean company evidently disagree, as their new TV is set to deliver a huge dose of 1970’s nostalgia. It’s shaped like a 1970’s CRT TV, and it even carries old-school volume and channel dials, which you can actually turn to adjust the volume and change the channel. And whilst the TV is 32 inches, its screen is styled like a 1970’s screen, as opposed to the ultra-wide 32 inch screens that we’re more used to watching. However, sometimes looks can be deceiving, because inside this LG TV lies some 2013 technology. For a start, you get a nice remote controller, so thankfully there’s actually no need to get up in order to play about with those dials on the front of the set. Somewhat more impressively, it also boasts of a crisp 1080p IPS display as well as the full spectrum of connected-devices connectivity that you would expect on a modern TV set. You also get the standard (for 2013) HDMI, USB and MHL ports. If we have succeeded in exciting you about grabbing one of these as a gift for granny, then we apologise. At the moment LG are only planning to release this TV set in their home market of South Korea where it will be priced at 840,000 won which equates to around £450 or $750. If LG launched their 1970’s TV set in the UK/USA, would you buy one?